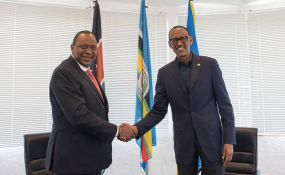 President Uhuru Kenyatta meets Rwanda President Paul Kagame. President Uhuru Kenyatta on Monday separately met President Yoweri Museveni of Uganda and Rwanda's President Paul Kagame, in a move political analysts believe is an attempt to broker peace amid a recent public fallout between the two Heads of State. As has become the norm in recent times, President Kenyatta did not announce he was leaving the country. President Museveni, however, confirmed that he hosted his President Kenyatta at State House Entebbe for bilateral discussions. The Rwandan Presidency also confirmed hosting President Kenyatta at the National Leadership Retreat in Gabiro. The Entebbe meeting was also attended by Uganda Foreign Affairs Minister Sam Kuteesa. These meetings come a week after Rwanda closed its main border point with Uganda at Gatuna town. Crucially, this border also links Rwanda with Kenya, where between 5-15 buses and dozens of trucks transports hundreds of passengers and tons of goods between the two countries. A few days back, President Museveni issued a warning of decisive destruction to 'anyone' planning to destabilize Uganda. "Those who want to disturb Uganda, they know our capacity. Our capacity is big. Once we mobilise, you cannot survive," he said. As President Museveni issued the warning, President Kagame said he had heard of people who have said they don't want to be destabilised but added those same people 'should not disturb others'.